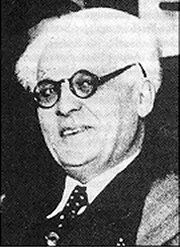 Mordechai Chaim Rumkowski (1877-1944) was nominated by the Nazis during World War II to head the Judenrat, who were the Jewish authorities in the Lodz Ghetto. Rumkowski reported directly to the Nazi ghetto administration, and was responsible for providing the essentials for the Jews in the ghetto and also had to find workers. The conditions in the ghetto, however, were terrible. Many inhabitants received inadequate food supplies and suffered from malnutrition; others died of disease. There is a debate about the role of Rumkowski during this dark time. Many view him as a collaborator and traitor, sending many Jews to their death, aiding and abetting the Germans in the deportations of many Jews to the Chelmo extermination camp. Others think he had little choice, and they say that he did what he did in hopes of ultimately saving the lives of most of the people in the Ghetto. Various sardonic versions of songs about Rumkowski, mostly called "Rumkowski Chaim," were sung around the ghetto, and even remembered to this day by some survivors. Listen to former Lodz ghetto resident and survivor Alter Pisarek sing a version of the song by clicking on the icon . As the seemingly never-ending parade of black locomotives chugged to the ramp, I was surprised to see how many people from ghettos or even concentration camps the Germans were piling in. This change raised opportunities for revenge, a chance to pay back the Jews and others who had turned against their own kind to gain an extra slice of bread or a more comfortable bed. The most blatant example I saw occurred in September 1944 when the Jewish policemen from the Polish city of Lodz were brought in. Among them was Chaim Rumkowski, president of the whole ghetto, as Lazar had been in our town. Rumkowski was getting the same reward as Lazar: death. The Lodz Jewish Council, through the Jewish police there, had turned in about fifty Jews who had been underworld members in 1940. These guys had been thugs, thieves, and con men. Like Lazar, they'd have people steal for them, then ransom back the goods. The men had committed all kinds of crimes, except murder. Strangely, in Birkenau they were a closely knit lot, but kindly. A few had become powerful Senior Block Inmates, including Morris the Hasid, to whom I had paid the fifty dollars to get my job with the Czech. There was also Blackie, who got his name because he was so dark-skinned. He had been a thief and a con man in Lodz, but here he was a man whose word was good and who took care of his people. It was Blackie I went to when I wanted a job for someone. I did it so often he once looked at me and asked, "Who else are you going to bring in here? Your uncle? Your cousin? Your nephew? No babies, Joe. I draw the line there. They're too young," he said, his dark skin framing a smile bright enough to light up the sky. Even though they usually were good people, Morris, Blackie, and the others had vowed revenge on the Jewish policemen who had captured them. One night, the former thieves had their chance. They spotted the Jewish police contingent from Lodz emptying out of one of the cattle cars. "We're going to have our revenge," Blackie whispered to me. "We're going to get them gassed." The policemen didn't know which line was which. Mengele had put them into the group that was going to live and be shipped off to labor camps. Then a couple of the Lodz underground group, including Blackie, walked over to the Jewish police, looked them in the eye, then pointed over to the death line. The policemen, not knowing the difference, meekly obeyed and were marched to their death. They joined Rumkowski, who was old and lame, and was being carried to the crematorium on a litter. "Take a look," Blackie whispered to me. "Now he's in a litter. He sent a lot of us to the camps. Lots of us were gassed. It's his turn." Rumkowski didn't know what was happening. He turned to me, of all people, and asked, "What goes on here?" "Can't you smell? Can't you see the fire?" I replied, anger and revenge in my voice for what he had done to my friends. "Oh, my God," he said, smacking his forehead with his palm. Then he started reciting a Jewish prayer as two guards picked up his litter to carry him away. There he was, a man who had been rich and powerful, in charge of a city out of which had poured the products of enormous factories. He thought he would save himself by doing the Germans' bidding. As they had for Lazar, the Nazis ultimately had more use for him dead than alive. I felt no sympathy, no pain. Rumkowski was a traitor and deserved a traitor's death. Later, I talked to Blackie about what they had done to the Lodz Jewish police. "You did what you did. I guess you had to do it," I told him. "We were pushed out of the ghetto because we were in the underworld. I didn't know any better. I considered it my job, which I went to while people were sleeping in their beds. But we had a heart, and this guy didn't," Blackie said, looking grim. Read much more about Joe Rosenblum's experiences during the Holocaust in the Museum of Family History's exhibition "Walk in My Shoes: Collected Memories of the Holocaust," or read his book in its entirety. "Defy the Darkness: A Tale of Courage in the Shadow of Mengele" by Joe Rosenblum with David Kohn, Praeger Publishers, 2001.